this is one of the cards we made today at my class at home. We used the thought bubble out of the Just Sayin' Framelit's set - just cut in half. Of cause the seagull is the bird punch - just sponged and markers (Basic Black and Pumpkin Pie) for facial features. The 'piles' are hand cut after stamping the "Hardwood" stamp and rounded with the 1" circle punch. The sea is the woodgrain embossing folder. I saw the idea on Pinterest (STILL in love with that site! lol) but there was no link to where it came from - if it was your idea then please let me know. 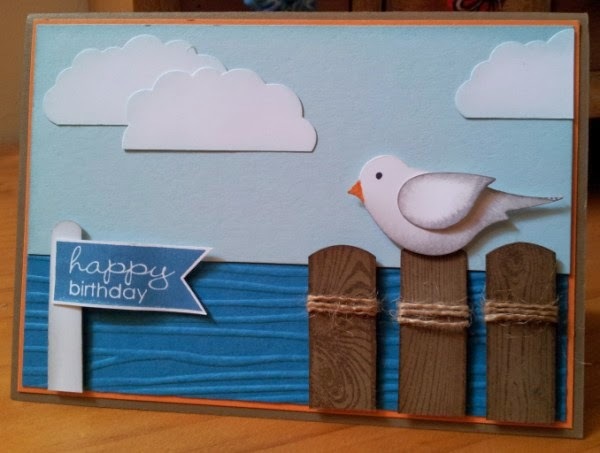 I did add the clouds and the sentiment flag on mast and used the stamps rather than embossing folder to change it up but still the idea was BRILLIANT so THANK YOU! "Bird Punch gull on the jetty, Feb 2013. I got my inspiration from Michelle Zindorf who does amazing brayering. I'll bet your ladies loved the class. oh wow Elizabeth your sample is GORGEOUS!! it's not the one I saw on Pinterest but WOW I love it! Yes Michelle is an amazing artist - what she can do with a brayer is awesome! Thanks so much for visiting my blog and sharing the link to your sample - I LOVE it!! !